Photograph courtesy of Ryan Kolter. For a week I had the opportunity to provide service to a family in need. My group was given the task of making an additional two rooms to a home that housed about six people. The activities we participated in included filling up buckets of gravel and sand to mix them with cement and later prepare the concrete that would be used to hold the structure together. We built the walls to the rooms and participated in mounting the roof. We transported material from one work site to another by using a wheelbarrow. We bent and cut wires. We made preparations to lay down the floor of the rooms by shoveling dirt to level the ground. These activities were all coordinated in partnership with the Fuller Center for Housing through Alpha Sigma Phi Fraternity. The rooms we built were basic, however the fundamentals of problem solving and applications to a real life structure were present for me. I realized that engineering is not only a career that caries wealth and a considerable amount of prestige. Engineering has the potential to impact the lives of many people. For this family, the addition of two rooms not only means a larger home, it means that their home will no longer be flooded when it rains. The previous night before we arrived, there had been a thunderstorm that had flooded their home. With the work we were able to do this will no longer be an issue. The career path I have chosen has the potential not only to provide me with a decent wage, but it allows me to apply the knowledge I learn in the classroom to communities that require assistance. Now, on a personal level I was able to notice the growth of the group as we interacted with the local inhabitants of the impoverished community. Most of the population was dependent on fishing as their main source of income or had to work in the service industry. Education was limited. One of our guides mentioned unemployment being somewhere between fifteen and twenty percent. During one of our reflection activities, we took a chance to explore the backgrounds of our group by exposing the amount of privilege we thought we had. Some of us had the privilege of a better education, growing up in a better neighborhood or the privilege of having a supportive family. This activity allowed us to appreciate the diversity within ourselves and helped understand how sometimes we take the things we have at home for granted. For these people, a fraction of the things we possess does not compare to the things they currently have or will ever have the opportunity to experience. Jolvin, one of the boys who lives in the house we worked on, was amazed at the ability of a phone to take a picture. He was entertained for hours taking pictures while we worked. We were able to talk to him for short period of times and found out his soccer ball was flat and could not afford to get another one. The group decided to buy him a new ball. He was ecstatic to have received that gift. When he invited his friends to play with his new gift, the first thing they asked him was who had given him the ball. They immediately assumed correctly that his family could not afford to purchase a new soccer ball and that someone must have purchased it for him. The group had a final reflection on our final night in Nicaragua. As we reminisced on the memories we created, we were able to collectively discuss some of the accomplishments of the trip. Through our work with the families and members of the community we were able to notice the level of appreciation that they had toward the time, effort and donations we made. The level of happiness and gratitude that they expressed was something few of us have witnessed in the United States. Most importantly, we had the ability to change the lives of the families. In one week we were able to make a long term impact that will improve the living conditions of the family that will occupy the home. The general consensus was that we wished we had the opportunity to stay longer. Not only did they appreciate our presence, but they were considerate of the extreme weather conditions we were not accustomed to. One thing we all take home is the friendships we made on the trip. In a single week we had the opportunity to bond in ways not many people have the opportunity to do so. Fraternities and Greek life in general do not always get the best representation by the media. The negative stereotypes that have been associated with Greek life have consumed the positive things fraternities have the ability to do. This experience is one that should not be disregarded. 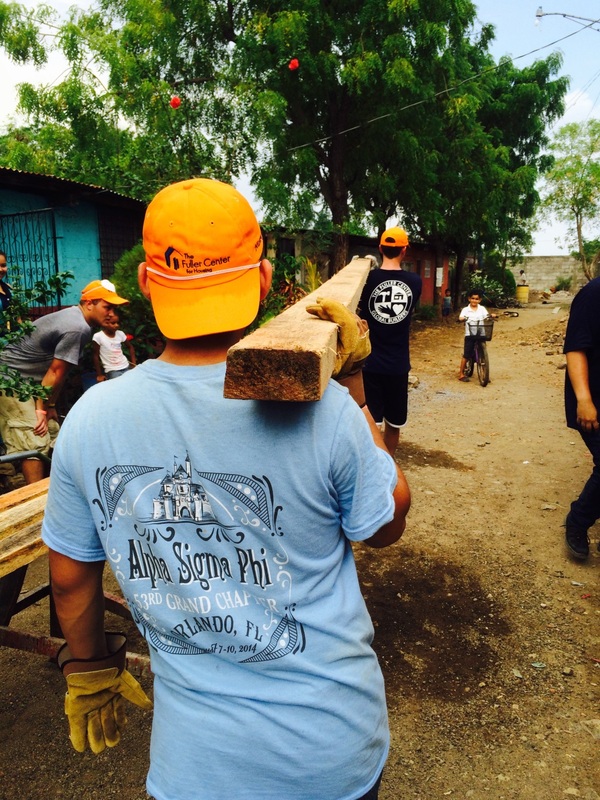 How can you serve internationally? (The Richter Center is a great resource!) If you cannot serve in another country, how can you make a difference at a local level?